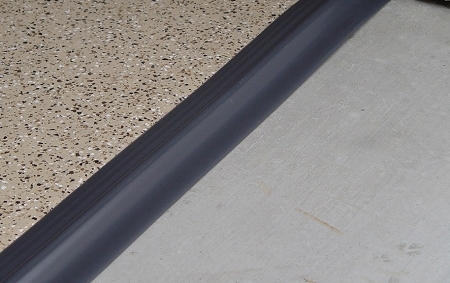 A garage door threshold seal keeps your garage clean while saving energy! 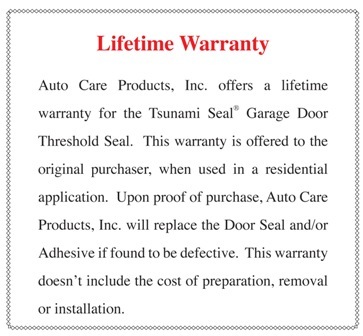 The Tsunami Seal® Garage Threshold Door Seal mounts to your garage floor creating the perfect seal between your door and your garage floor. The Garage Door Threshold Seal creates a tight seal for your garage door which will keep leaves, dirt, water and snow from being blown under the garage door by the wind. Also, if you have a sloped driveway or an uneven garage floor and water is seeping under your garage door, the Door Seal adds a 1/2" tall barrier to the garage floor. The door seal will also help keep out unwanted insects and snakes. By creating a better seal, your garage will stay warmer during the winter and cooler during the summer, helping to keep your energy cost down. 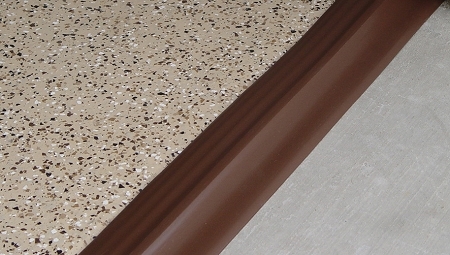 The door seal is available in gray, brown and black to blend with the color scheme of your home. "This item cannot ship to Alaska or Hawaii. Call 800-992-2018 for more information regarding availability in the locations." Q: Wy do you not display the price for your products? Q: Why don't you display the price for an item? Q: The current concrete floor has been sealed with some sort of concrete paint over an uneven surface. Should I sand blast the garage floor area where the seal will be installed? Should I fill in the low spots in the floor with a flow-able concrete filler prior to the application of the seal. The Door Seal works great with all types of garage doors including roll up doors, hinged wood doors and walk through doors. 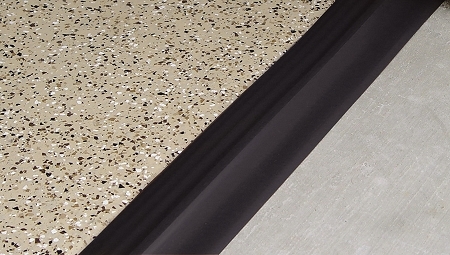 The one piece strip is permanently secured to the garage floor with the included Liquid Nails Polyurethane Adhesive. The Door Seal is available in 10',16', 18' and 20' kits which include the one piece Door Seal, Liquid Nails Ultra Duty Poly Adhesive and a metal caulking gun. 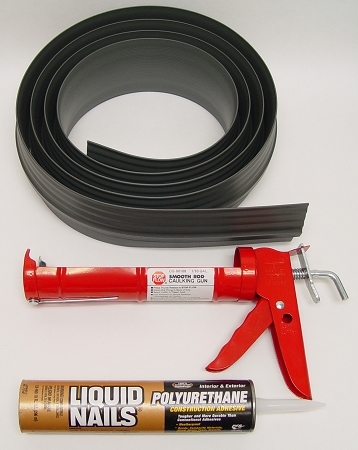 Contractor kits are also available in 50' and 100' lengths which also include the Liquid Nails Ultra Duty Poly Adhesive, without the caulking gun. Keeps out insects, snakes and rodents. Garage stays warmer during the winter and cooler during the summer. Works with roll up doors, hinged wood doors and walk through doors. Available sizes 10’, 16’, 18’, 20’, 50’ and 100’. Available colors allow you to match your Threshold Seal to the color scheme of your home. Includes cartridge(s) of Liquid Nails, Ultra Duty Polyurethane Construction Adhesive. Includes a metal caulking gun (except for 50’ and 100’ Contractor kits). Makes applying the adhesive fast and easy without purchasing any additional tools. To view or print the assembly instructions, please click on the link below. The unique vinyl polymers used to produce the Tsunami Seal® Garage Threshold Door Seal, in conjunction with the outstanding properties of Liquid Nails Ultra Duty Poly Adhesive, allow Auto Care Products, Inc. to create a product that is so durable that we can offer a lifetime warranty.